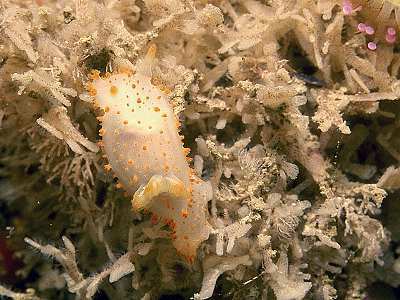 MOLLUSCA : NUDIBRANCHIA : Triophidae SNAILS, SLUGS, ETC. Description: The body is translucent white and may reach a length of up to 35mm. Small, forked, bristly processes, scattered all over the body make it easy to identify. These bristles are yellow/orange in colour. The oral tentacles are short and similarly pigmented. 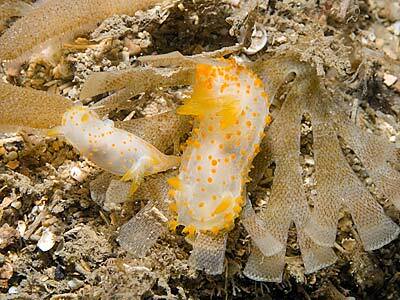 The rhinophores are lamellate and their tips are covered with yellow pigment. Habitat: Usually closely associated with the bryozoan species Chartella papyracea but occasionally found on Flustra foliacea or Securiflustra securifrons. Distribution: C. papillata is only found sublittorally, to the south and west of Britain, but extends up the Irish west coast as far as Portrush, Co Antrim and also to St. Kilda, off the west coast of Scotland. Further distribution includes the Mediterranean. Branched yellow processes all over mantle surface. Picton, B.E. & Morrow, C.C. (2016). Crimora papillata Alder & Hancock, 1862. [In] Encyclopedia of Marine Life of Britain and Ireland.